Below is a link to the chairman’s report, by Dr Paul Davis, to the 2019 Annual General Meeting. For those of you who’ve been asking (okay, nobody actually asked, I just thought I’d tell you anyway), the title of my (mostly) weekly column, Beit Emanuel Matters, is a play on words. It covers Beit Emanuel matters, but it’s also a statement asserting that Beit Emanuel really does matter, not just to its members, but to Progressive Judaism and Judaism as a whole in Johannesburg. Beit Emanuel punches well above its weight in all respects, and is a core component of Johannesburg’s Progressive Jewish infrastructure. On Monday afternoon we planted an olive tree on the somewhat neglected west aspect of the Shul building. The Children from our Benny Stalson Hebrew School were joined by parents and a sprinkling of other congregants and friends for the planting, which was organised by our in-house horticulturalist, Kathryn Peck, assisted by gardener Edgar Banda. We are pleased (not to mention relieved) to advise that our landline switchboard number (011 646 6170) is now functional, after being out of action for roughly 7 weeks. The number will usually be answered by our new Receptionist/Admin Assistant, Morgana Segel, who started here on the 21st. Give us a call, or pop around during office hours to meet her. We all like her, and we think you will too. A very nice pair of spectacles (+2.5 readers) were left in the Courtyard 2 Friday nights ago. Please claim them from Morgana in Reception. We also found a single spectacle lens on the Bimah last Friday evening. Same drill. Please note that the date for our next Cinema Emanuel event has moved out by 1 week to Sunday, 3 February 2019. This is due to International Holocaust Remembrance Day on Sunday the 27th. Please see the detailed insert below. No, walking to shul on Shabbat is not a requirement in Progressive Judaism. If you are thinking along those lines, though, they’ve broken ground on a new residential development across the road from us. Should a member of Beit Emanuel purchase a unit there (units starting at R2.3 Bar), the selling agents, Adrienne Hersch, will donate their commission to the Shul. How’s that for win-win? Details regarding the development on their website, http://ahdevelopments.co.za/oxford51/. Rabbi Saar will be presenting “a 12-week journey through the history of the Jewish Mystic tradition” starting on 5 February. Please see the attached flyer for details. Participation is free for BE members and friends, but places are limited and registration with the Shul Office is essential. Further down the line, we’ll be holding a decision-making session regarding our youth programmes with Bet David on Saturday, 2 March. Pencil it in if you’re between 14 and 18. Details in the attached flyer. I have a lot to say this week, so please bear with me! First, we wish all our Members and Friends (both formal and informal) everything of the best for 2019! The holiday season is well and truly behind us. Jozi is almost back to its usual frenetic pace, and seaside vacations have quickly become a distant memory. By the end of next week, our full programme of Shul activities should be in place. Our Shabbat evening service will still be in the Slome Auditorium this Friday evening (with the Brocha in the Courtyard and Slome Foyer), but next week we’ll be back in the Shul, along with the Beit Emanuel Choir. Please be aware that this entire area has been subject to a water outage this week, which hadn’t been resolved as at the time this Bulletin was compiled. The fact that Ockie in the kitchen has been able to provide the usual outstanding Friday night Brocha is nothing short of a minor miracle. If services haven’t been restored by Friday evening, hand sanitiser and/or wipes will be provided in the bathrooms, but flushing will still be an issue. Our Internet connectivity has been restored since the previous edition of the Bulletin was published in December. Our landlines are still down, but the technical team from our service provider are currently working on a solution, and that service could be restored by later today. We hope to have migrated away from Telkom and ADSL onto a Fibre infrastructure by the end of this quarter. Every year, in the build-up to the summer holidays, we remind our Members that there are Progressive/Reform congregations in all the major centres in SA, and that attending a service at the shul nearest to your holiday destination might be a worthwhile experience (as well as fulfilling the Mitzvah of making up a Minyan). I can now talk to this from personal experience. Jeanette, Hannah and I spent a week in the Southern/Eastern Cape in mid-December, and Hannah and I attended a Shabbat evening service at Temple Israel Port Elizabeth. We were warmly received, spent a pleasant evening in the company of the Temple Israel PE “regulars” and almost managed to make up a Minyan. Our heartfelt thanks to all those who contributed so generously towards our Chanukah Appeal, paid their membership subscriptions on time (or early) and/or pledged to contribute to our dedicated Building Fund and community assistance fund (name TBC). You rock! Thanks to your generosity and sense of duty, we have entered 2019 in a far healthier condition financially, and we’re determined to keep things that way. All donations should have been acknowledged individually in the Bulletin. Please let us know if yours hasn’t been for some reason. We wish Rabbi Saar, Sharon and family a heart Mazal Tov on the purchase of their new home in Observatory. The apartment they lived in on the Shul’s Campus is now being prepared for occupation by outside tenants. Our Religion School has been re-branded to honour the memory of Benny Stalson, beloved teacher of several generations of Reform Jews in Johannesburg. (Also my teacher, who did his best to prepare me for my Bar Mitzvah in the early 70s.) The Benny Stalson Religion School lives again! 1. Saturday 19/1, from 9:15 onwards in the shul garden: Since this is Shabbat, we will start with the communal service. I’ll be waiting for you for a short chat before the service begins. 2. Monday 21/1, from 16:30 until 18:00: This date marks Tu B’Shvat, the Jewish Festival of the Trees. We will plant an olive tree, study and celebrate. Barring unforeseen circumstances, Beit Emanuel’s Annual General Meeting (AGM) will be held on the evening of Thursday, 21 February 2019. Please pencil it in. Formal notices, etc., will be issued 2-3 weeks before the meeting date. We hope that this year’s meeting will be less fraught than the 2018 meeting. Perhaps we’ve now learned the lesson that it’s not our differences (political or otherwise) that matter so much as how we treat one another despite those differences? In late 2018 we undertook a review of our Operations structure and workload, as a result of which we will not be filling the vacant post of Synagogue Administrator. Those functions will now be shared between me, Christine McIntosh (our Financial Administrator), and a new junior Receptionist/Admin Assistant post. We hope to have that post filled and operational by Monday 21 January. Further details in next week’s Bulletin. Our Proudly Progressive Shabbat Project took place over 26/27 October. Our Shabbat programme is pretty full as it is (especially on Saturdays), so the only additional activity was the Tallit-making workshop facilitated by Sharon Shaked. Now that PPSP has become an accepted part of our Shul calendar for the year, we’ll see what we can do to enhance the programme for next year. I’m pleased to report that some congregants mentioned that they had attended specifically to support the Shabbat Project, and I’m now able to put faces to a few more names. Sadly, 27 October 2018 has also become a date that will “forever live in infamy”, as the date of the massacre of 11 congregants at Tree of Life Or L’Simcha Congregation in Pittsburgh. We will be participating in the AJC #ShowUpForShabbat initiative (supported by the SAJBD and SAUPJ) this weekend, and the names of those murdered will be read out before the Mourners Kaddish. Please see the attached SAJBD mailing for more details, but in a nutshell, show up here, and post about it on social media. Our 14th Annual Franz Auerbach Interfaith Memorial Lecture was held on Tuesday evening (30 October), and featured our captive guest speaker Irwin Manoim. With his usual dry wit and acerbic style, Irwin took apart some of our most treasured notions about ourselves as a people, including the idea that reasoned debate and discussion have always been part of our DNA. In line with Lesley Hudson’s vote of thanks, I won’t try to do justice to Irwin’s lecture in a paragraph or two. For those of you who weren’t there, we will probably make the lecture available in at least one medium. Why weren’t you there, by the way? 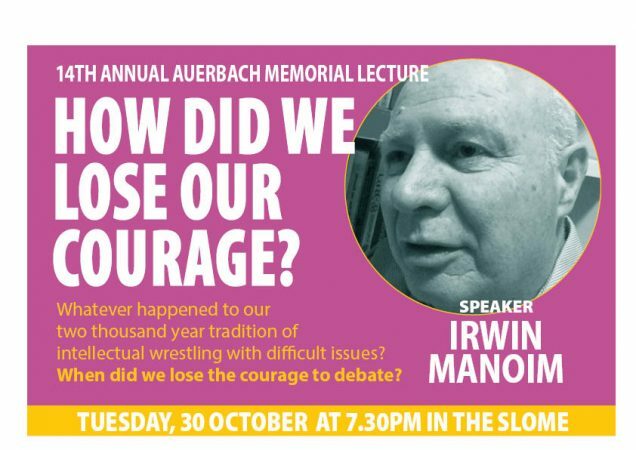 Irwin Manoim is perhaps not as famous as some of our previous Auerbach Lecture speakers, but he is one of the moral and intellectual giants of the late and post-Apartheid era. Next time he speaks, I strongly recommend that you take advantage of the fact that he hangs around at Beit Emanuel, and come and listen to him, whatever the topic or occasion. At the very least you’ll get a chuckle out of it, and probably go away with a new perspective on whatever he’s talking about. We note with sadness that it’s a year (1 November) since Mandla Makhubu passed away. Even in his absence, he is still very much a presence on the Beit Emanuel Campus. MHDSRIP. If you attended the service in the Janks Hall last Friday, please complete the VERY brief online survey linked to elsewhere in the Bulletin. ONLY if you were here last Friday though. We couldn’t help noticing that many of our regulars didn’t attend, and we’re hoping it was due to the inclement weather. If it wasn’t, we’re counting on you to set us straight. You’ve seen the revised date for the Auerbach Lecture, right? It’s now Tuesday, 30 October instead of 23 October. We’re still looking for more recruits for our Volunteer Security Team, which is somewhat under-strength at the moment. If you’re the outdoor type, and you’re looking for a way to put something back into the community, the Security Team is for you! Remember that the more active members there are, the less shifts each member will need to stand. Please contact Graeme Hochschild or Virgil Challens to find out more. Details in the sidebar of the Bulletin. A serious request to please keep your speed down to 20 km/h or less when on the Campus, especially when attending services and other events. We have many blind spots, and speeding vehicles are not good for the elderly, the infirm, distracted children and cats. Lots of cats. On the subject of security, please wind down your driver’s side window when approaching the gate, especially if your vehicle’s windows are heavily tinted (which most are these days). This will help to speed up the process at the gate. If you’re a member, you’re welcome to collect a vehicle security sticker at the Shul Office, which will also speed things up (just not above 20 km/h!). Gauteng in 2018 is quite a dangerous place, and we need to find a balance between being a warm and welcoming community and having some idea of who’s coming through our gates. We encourage members to invite guests who are curious about Progressive Judaism to attend our services and other events. 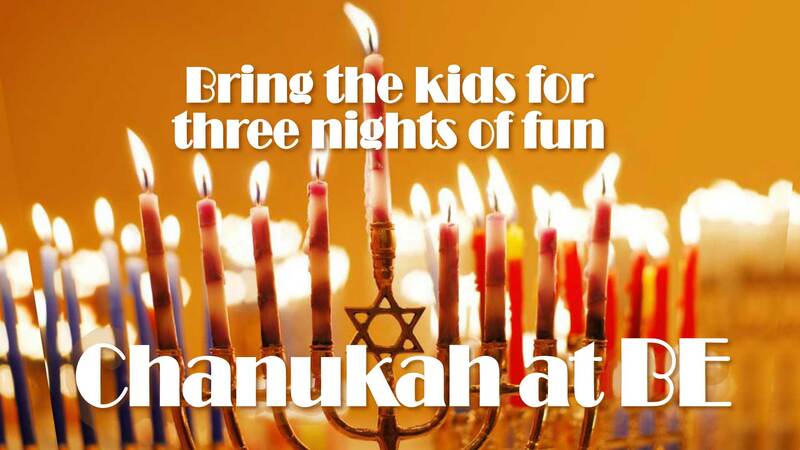 If you’re not accompanying them, however, please notify the Shul Office that you’ve extended the invitation by completing the form on the Contact Us/Forms page of our website, or by using this link: http://bit.ly/2pMH7Uo. This is particularly important if you’re inviting guests who may be unknown to our security staff and volunteers. If you prefer a “belt and braces” approach (and to avoid any embarrassment), please let me know at email address [email protected] and I’ll ensure that they’re on the Guest List. Especially for our older members, we really need some method of electronic communication with you. If we have an email address and/or a mobile (Cellular) number for you (preferably both), we have all we need to stay in touch. (If not, then at least a fax number we can send your Yahrzeit notices to.) The details don’t necessarily have to be your own, provided that the person (e.g. your daughter, son, or even your bookkeeper) is willing to pass on the messages to you. When Avi’s away, the Choir will play. Choirmaster Avi Kanar is away this week, so the format of this evening’s service will be slightly different. The venue is the Janks Hall, and the Choir members will be distributed amongst the congregation. To accommodate this, the Brocha will be in the Courtyard/Boardroom/Slome Foyer area. The JKids Shabbat service takes place in the Boardroom, so a quick set change will be needed once the kids have left. Speaking of venue changes, the JTalk on the 20th (next week) will be in the Slome Auditorium, to accommodate what we hope will be a larger-than-usual attendance. See the attached flyer for details. Just in case you’ve forgotten to pencil in this year’s Auerbach Lecture, the date you’re looking for is Tuesday, 23 October, 19h00 for 19h30. The Proudly Progressive Shabbat Project is the weekend of 26/27 October. Our programme is more or less the same as usual, although there will be a couple of extra goodies (details to be announced) and one or two special flourishes as a hat tip to the P/P Shabbat Project. Since the untimely demise of the SA Post Office (at least for all practical purposes), we’ve struggled to get material out to those who don’t have some means of electronic communication. This has come up as an issue again with our automated Yahrzeit Notices. So, if you don’t already have an email address, mobile (Cellular) number or fax number on file with us, please provide one. Those are the only options available to us for sending out these Yahrzeit Notices to you. Request to attend a service at Beit Emanuel: http://bit.ly/2pMH7Uo. This is to simplify the process for non-members wishing to attend a service here. The link is also available on our website. We’re experimenting with trying to make our JTalk sessions available as podcasts. This is where you’ll be able to find them: https://anchor.fm/beitemanuel. Copies of our weekly Bulletin will in future be made available online. You’ll be able to find them here: Beit Emanuel Bulletin – Google Drive: http://bit.ly/2yzjByb. The trend of strong attendance at our High Holy Days services continued during Sukkot, especially the Erev Sukkot (Open Sukkah) service on Sunday evening. The Shul, Janks Hall and Sukkah were all filled with members and visitors, both regulars and curious first-timers, of all faiths. This weekend will bring the “season” to a close, with our Pride Shabbat service on Friday evening and Shemini Atzeret/Simchat Torah services on Sunday evening and Monday morning. Treasurer Ian West and former Chair Liebe Kellen will be honoured as Chatan Torah and Kallat Bereshit respectively. On Tuesday, our facilities staff will start to take down the Sukkah, and after that, 5779 will be in full swing. Just while I think of it, a quick “Thank You” to those who donated towards the new state-of-the-art sound system for the Choir, which operates independently of the hard-wired sound system in the Shul and Hall. We hope you all enjoyed listening to the Choir without the audio glitches we’ve been experiencing. It was wonderful to see so many old and new friends over the HHDs, with the Kol Nidrei service being particularly well-attended. If you’re not a member, and we only see you here once or twice a year, please remember that for our doors to open one day a year, we have to keep them open 365 days a year (or 354/384 days a year, if you prefer the Hebrew calendar). One of the ways we do that is to encourage people to become members of the congregation. This means accepting our “Ts & Cs” and contributing to the finances of the Shul. We have a variety of options for those wishing to become members, and as a matter of principle and practice, we never turn away anyone unable to afford our standard pricing. So, if you’re hesitant to enquire about membership because you don’t think it’s affordable, put your mind at rest and make that call. We’ll meet you at least halfway. While the High Holy Day “season” is far from over, Rosh Hashanah and Yom Kippur are now behind us. Attendance was strong at all our services, and feedback regarding the new Machzor (Mishkan HaNefesh), the allocation of honours and the increased participation of lay readers in services has generally been positive. A second presentation of our Vision for Sustainability was held Motzei Shabbat on Saturday, 15 September (Shabbat Shuvah). We plan to hold further presentations, perhaps during one of our Friday evening Oneg Shabbat meals? Your feedback in this regard would be appreciated. We expect that many of our regulars will be “Shul-ed out” by Friday evening, so we’re not expecting a big turnout for our Shabbat services this weekend. We will still be open for (spiritual) business as usual, of course, and we do hope to see you all on Sunday evening at 18h00 for Sukkot. You all know what’s coming next. DON’T skip ahead, unless you have no interest in the future of Beit Emanuel. It should be no surprise that shuls in general are to a large extent “crowdfunded” by means of membership fees and donations from congregants. Beit Emanuel is no exception to this, although we have managed to build up other sources of income over the years. In a sense, though, Beit Emanuel is more dependent than most on those fees and donations, because we have very few “Machers” or mega-donors to give us that boost. It should also be no surprise that many shuls rely on their High Holy Days fund-raising appeals to build reserves or close the gap between quality income and expenses. Once again, Beit Emanuel is no exception to this. We are therefore very concerned that donations in general (and over the HHDs in particular) have dropped off over the past few years. We therefore appeal to all our members (and friends who aren’t members) to revive the tradition of HHDs’ giving (whether it’s R180 or R180,000) to help bolster this essential component of the Shul’s revenue streams. Our members and friends tend to be quite effusive in telling us how much they love Beit Emanuel. We need you to show us the love in a concrete way, by contributing financially (over and above membership fees), to whatever extent you can afford. We’re attaching a copy of our High Holy Days appeal form, which may help you in deciding how much to contribute, and by what means. Help us to make crowdfunding a part of the ethos at Beit Emanuel again! Kabbalat Shabbat Service: 06.00 p.m. – in the Shul, followed by a Kiddush in the Janks Hall. This Friday’s Brocha has been sponsored by Tammy and David Bolon. Thank you! JTALK – 11h30 (Boardroom) – Ivor Chipkin on the subject of “A new right emerges in South Africa”. TALMUD STUDY – +/-12h45 – Tractate Berachot, using the new Koren Hebrew/English edition of the Talmud. The Talmud Study Group meets in the Community Library (Classroom 3).